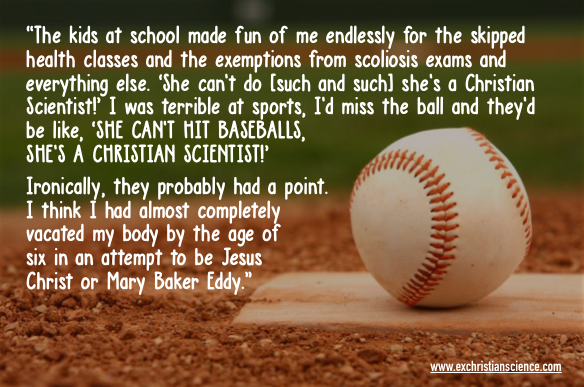 The following is a collection of contributions from members of the Ex-Christian Science collective about growing up in Christian Science. It was very difficult to explain my religion’s beliefs to my friends. I was always trying to make it sound like a more ‘normal’ religion, in fact writing “United Church” on a form once because I was embarrassed to write Christian Science. I so wanted to be like everyone else. I didn’t want my friends to know that there was no minister at our church, that there were two people on a podium and one read from a book of garbled language I couldn’t understand and finally, it was mortifying to explain that I had to go to Sunday School instead of the church service until I was twenty! When I was growing up, we definitely had pictures of Mary Baker Eddy around our house. My parents gave me a framed portrait to keep on my bedside table, in fact. I was pretty much a believer throughout my entire childhood. Then I went through the ‘it works, it’s just not for me’ phase. I think I was in my late twenties when I finally realized how much I had been misled. It’s hard to know better when everyone around you, particularly your loved ones, are fervent believers. When we would come home from school and announce fearfully that measles or something else was going around, my mother would say firmly, “Contagion is all in the mind!” and send us back to school. I would brag to the other students that my siblings and I never got sick because sickness was all in the mind. Then I got chicken pox. I had no idea what was happening to me and of course my mother wouldn’t have had any medical education to help with that. I remember lying alone and sick in my room staring at every inch of my skin. Where was the chicken that I was sure would be sticking to me? 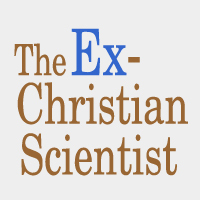 I did everything I could to hide the fact that I was a Christian Scientist. Even my closest friends didn’t know. It was embarrassing. It made me different in ways I didn’t want to be different. Sunday School was an hour of torturous boredom, and often my parents had to fight with me to get me ready in time to go, and when I was a little kid, I couldn’t stand the little old ladies who always wanted to pinch my cheeks. Ugh! I hated that! That is why to this day, I am always extremely respectful of peoples’ personal space–especially children. Hey, Jeremy, thank you so much for respecting children’s personal space. You’re teaching BOTH the parent AND child that “no means no.” On behalf of all innocent children everywhere: THANK YOU. Jeremy: I was just like you; totally embarassed by CS. The walk from the car to the door of our little CS “church” was mortifying because I could see people across the Baptist church parking lot who went to my school. I held that secret cult close to the vest as I could. Being told to “just know the truth” by my mother used to drive me crazy. I hated Sunday school there as well. Nearly died of boredom. I’m lucky and glad that I got out as a teenager, refusing to return ever.